Enjoyed this Home Repair mystery. This is the sixtth book in this series. Lots of suspects and some trivia about Maine, U.S.A. Released for week#7 of Don't Judge a Book By its Cover (door on front cover). Enjoy! Took from the bookshelf at work and released at the meet-up tonight in Burnaby. Picked up at meetup after I was determined not to take any more. However this looks like fun. I thought there might be home repair ideas at the back, or recipes for feeding repairers, but no. Like any of the themed mysteries you can almost read this for the work on the house and that was what I was doing until the plot turned quite dark. I haven't read the earlier books but this deals with the whole back story and becomes very dramatic. Knowing that the author lives in the town she portrays makes the descriptions more interesting, but also makes one wonder about comments about the all-knowingness of east coast small towns (which I believe) and then having characters act out of basic ignorance as to the circumstances of a life long inhabitant's life. A very good read, though. 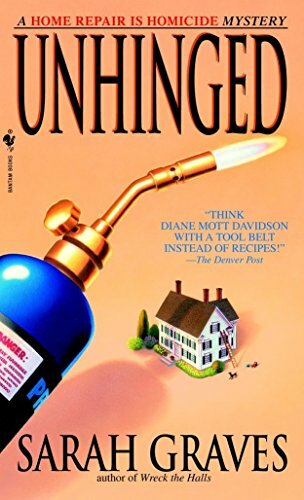 Liked this book, enjoyed the characters and the house problems. Releasing at Cowboy Coffee, have a latte and pastry and enjoy! First time I have read anything written be Sarah Graves. I will look for more of her books.